Ground Penetrating Radar Systems, LLC. is very familiar with high volume and urgent projects. GPRS was called that afternoon and was able to arrive on site to scan the entire area with ground penetrating radar and signal induction technologies. GPRS completed the survey for electrical conduit and reinforcements and was able to determine that the area was highly congested with conduit and reinforcements and thus avoid costly damage that could have taken place, had not locating been completed. GPRS was able to provide alternative mounting locations for the garage door columns to be mounted to the floor. 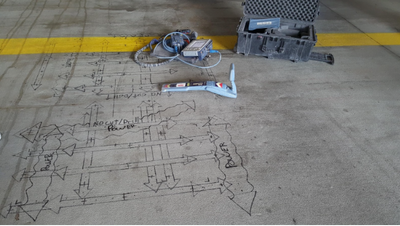 Ground Penetrating Radar mapping is a great tool to scan areas of post tension cables, rebar, and conduits, including PVC pipes. Ground penetrating radar can also be used to locate underground utilities such as water, gas, electrical, communication, sewer, and other objects prior to digging or excavating. GPRS provides real-time results, with markings directly on site as well as wide options for documented reporting. Please contact Ground Penetrating Radar Systems – GPRS to learn how we can assist with your next project.